AddToTrello is a Microsoft Windows application to add tasks to your Trello Board without requiring launching the browser. Its simple and fast operation mode allows to reduce the time needed to add a task to a minimum. 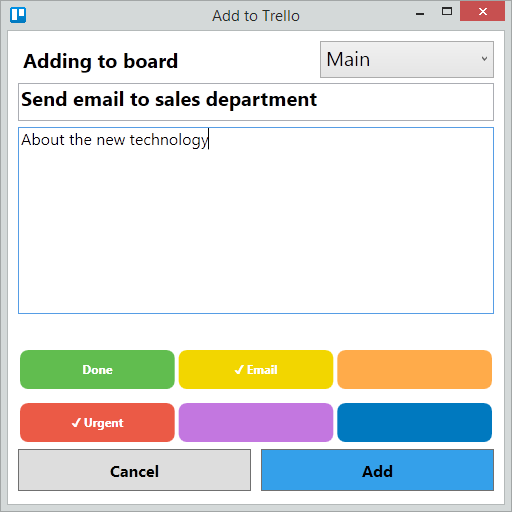 It is built on top of Manatee.Trello with WPF. After installation, first launch will require you to authorize the application with Trello. Simply click the link and paste the authorization token inside the window. The task will always be put on the bottom of first list of selected board. Pull requests are welcome. Please send email to slurdge@slurdge.org for any requests.